iPhone 7 Plus Screen Protector, 2-Pack 9H Hardness 0.3MM Slim [Bubble Free] [Ultra-Clear] [Scratch Proof] [Case Friendly] Tempered Glass Screen Protector for Apple iPhone 7 7s Plus 5.5"
Color:For iPhone 7 Plus Color:For iPhone 7 Plus Tempered Glass Protectors for iPhone 7，iPhone 6s/6 (4.7-inch). 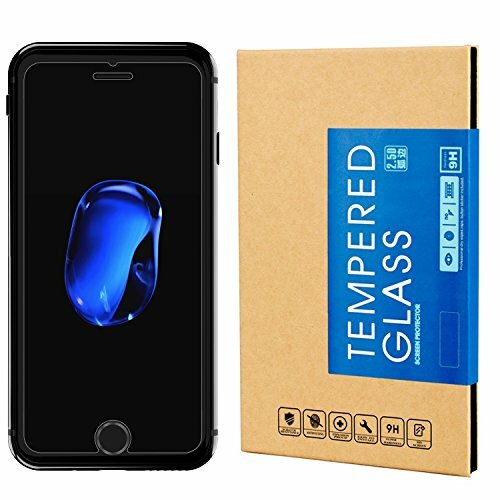 The tempered glass screen protector is made of premium transparent glass with 9H hardness which makes glass protector durable and strong enough to effectively protect your screen from scratches, dust and other external damages. Oleophobic coating on the screen protectors that does a great job at protecting against fingerprints, water and oil stains efficiently. 0.3mm thickness and 99% high definition can provide a natural and ultra clear viewing experience and promise not to detract from the sensitivity of the touch screen. The glass screen protector feels smooth and comfortable to the touch and slide, your finger can glide across the whole screen easily. Easy to apply with the supplies and the manual. No bubbles, no dust trapped underneath, no corners lifted, no fingerprints. Provides your phone a crystal clear appearance. Tips: Follow the instructions step by step and install the screen protector after washing your hands. Remove the tiny dusts, clean the screen and put the glass protector in accurate place, press the center of the screen protector lightly and it will adhere itself to the screen closely and automatically. Note: Because of the curved-edge design of the iPhone 7, our screen protector is a little smaller than the actual screen and can not cover the entire screen. This is to prevent the protector from unwanted bubbling and peeling up around the edges. Feel free to contact us if you have any questions about the products.